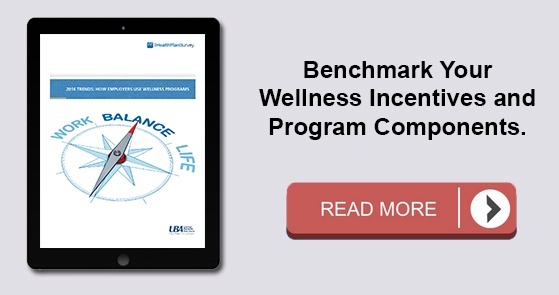 As wellness programs begin to be viewed as a part of the traditional benefits package, the key differentiator is creating a culture and environment that supports overall health and well-being. Visible engagement and support from front-line and senior leadership drives culture change. By prioritizing health through consistent communication, resource allocation, personnel delegation, and role modeling/personal health promotion practices, employers gain the trust of their employees and develop an environment situated around wellness. When employees recognize the importance of wellness in the overall company strategy and culture, and feel supported in their personal goals, healthy working environments begin to develop, resulting in healthier employees. Looking beyond traditional wellness topics and offering programs that meet the goals of your employees also leads to higher engagement. The American Heart Association CEO Roundtable Employee Health Survey 2016 showed improving financial health, getting more sleep, and reducing stress levels are key focus areas for employees as part of overall wellness. More so, employees see the benefits of unplugging and mentoring, two new topics in the area of overall well-being. While most employers feel their employees are over surveyed, completing an employee needs or preference survey will ensure your programs align with your employees’ health and wellness goals – ultimately leading to better engagement. Wellness programs are not immune to generational differences, like most other facets of business. While millennials are most likely to participate and report that programs had an overall impact, they prefer the use of apps and trackers along with social strategies and team challenges. Convenience and senior level support are also important within this group. Generation X and baby boomers show more skepticism toward wellness programs, but are more likely to participate when the programs align with their personal goals. Their overall top health goal is weight loss. Ultimately, addressing the specific needs of your member population and providing wellness through various modalities will result in the greatest reward of investment. Evaluation and data are the lynchpins that hold a successful program together. Consistent evaluation of the effectiveness of programs to increase participation, satisfaction, physical activity, and productivity – all while reducing risk factors – allow us to know if our programs are hitting the mark and allow for additional tailoring as needed.